Vargo Tour Card Golf Discounts $5 For Sr./Jr. Vargo Golf Company offers five world class golf courses for you to choose from. Myth, Bruce Hills, Golden Hawk, Whispering Pines, Hampton, and Little Myth (Par 3). 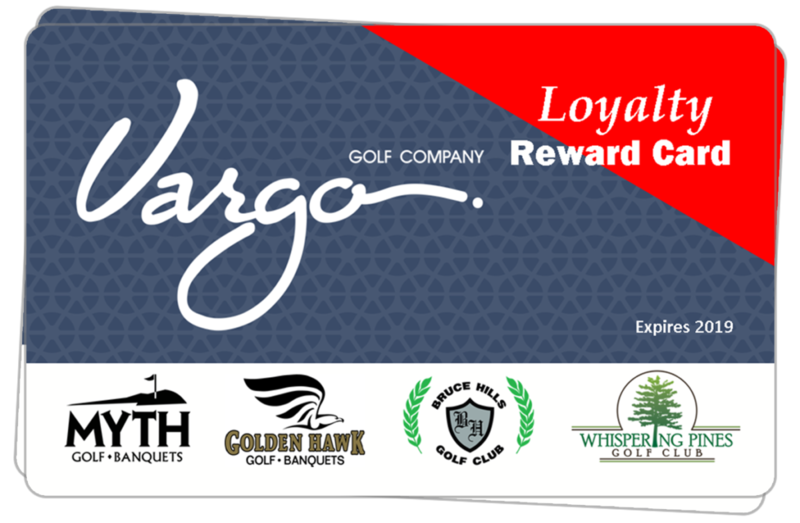 For the best deal on golf, consider purchasing our VTC card (Vargo Tour Card). Save $5.00 off each peak rate round of golf throughout the season at any of the Vargo Golf Properties! The VTC card cost is $5.95. These sell out fast so purchase your loyalty card online and conveniently pick it up the next time you come to any of the locations listed below in our benefits section. They are also for sale in the pro shop while supplies last!